It may be 100 degrees, here in SoCal, but I’m ready for pumpkin recipes. 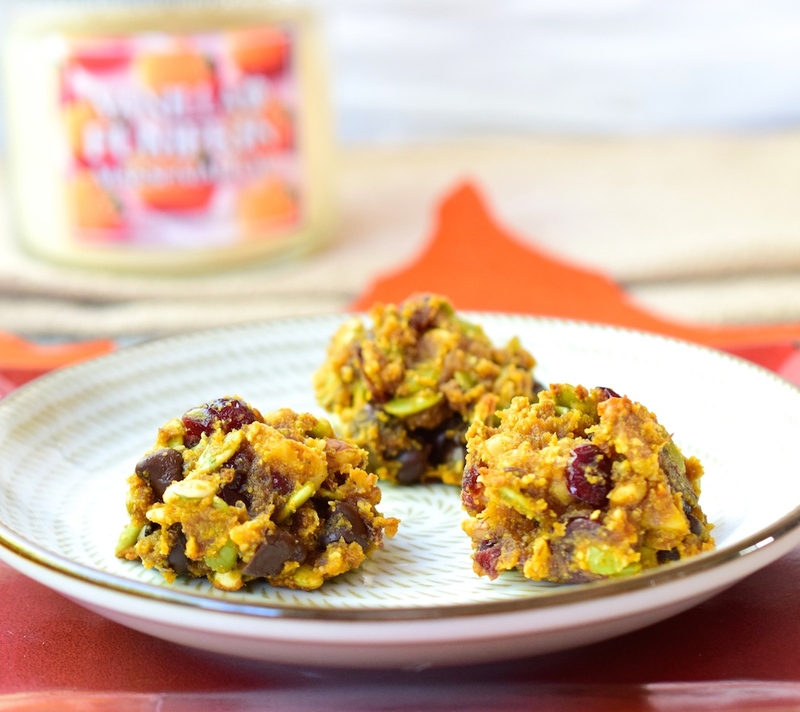 So far most of the pumpkin that enters my mouth is in the form of my favorite Apple Pumpkin Fall Smoothie, but these little gems were very popular as an after school snack for the kids! I’m calling them Vegan Pumpkin Granola Cookies, because I couldn’t decide if they should be cookies or granola bars. Whatever you want to call them, they’re really tasty! They’re also both paleo and vegan, so that’s a double bonus! 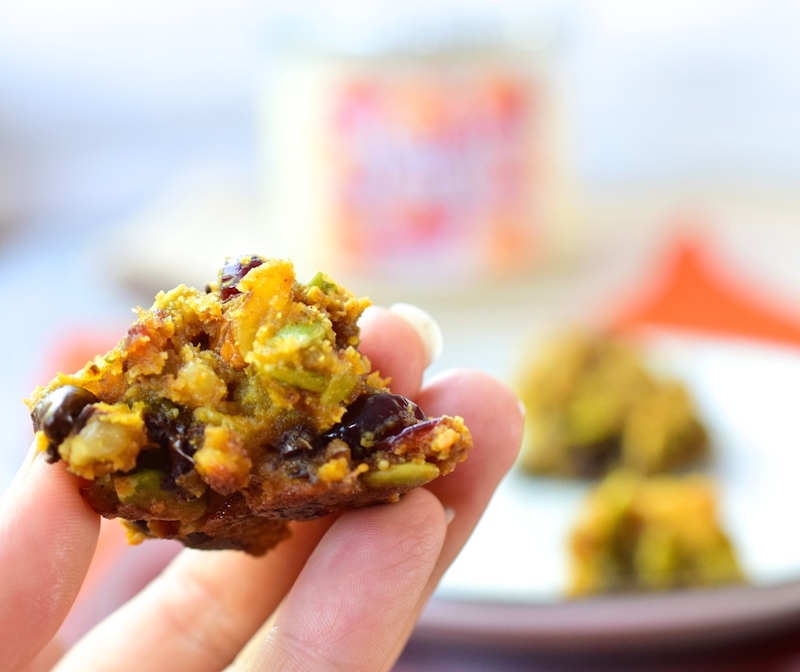 The ingredients in these cookies combine to be a very complete snack, or even breakfast! The pumpkin seeds and walnuts bring protein and healthy fats to the table, pumpkin brings vitamins, minerals, and fiber, and coconut oil brings more healthy fats. pumpkin seeds also have trytophan and antioxidants, and they’ve been shown to help regulate insulin. For more information about pumpkin seeds, check out this article. Don’t forget the chocolate, too! Along with iron, fiber, and trace minerals, the chocolate has neurotransmitters that make you feel good…sorry if you’re sick of hearing me say that, but I’m super happy that chocolate is good for you! Of course, I’m not talking about milk chocolate, I’m talking about the dark stuff. I actually used paleo chocolate chips for this recipe, so you pure paleo proponents would be proud. If you’re not ready to drop the big bucks for paleo chocolate chips try using the 70% chocolate bar from Trader Joe’s, and break it up with a meat mallet. Thanks for sharing my recipes on social media! Please use this image for Pinterest. Before we get to the recipe for the Vegan Pumpkin Granola Cookies, I want to invite you to join with others who are making healthy changes. I’d love to walk alongside you in your journey towards wholeness and health! Jesus said, “I have come that they may have life, and have it to the full!” Freedom from food addictions is part of having a truly full life. 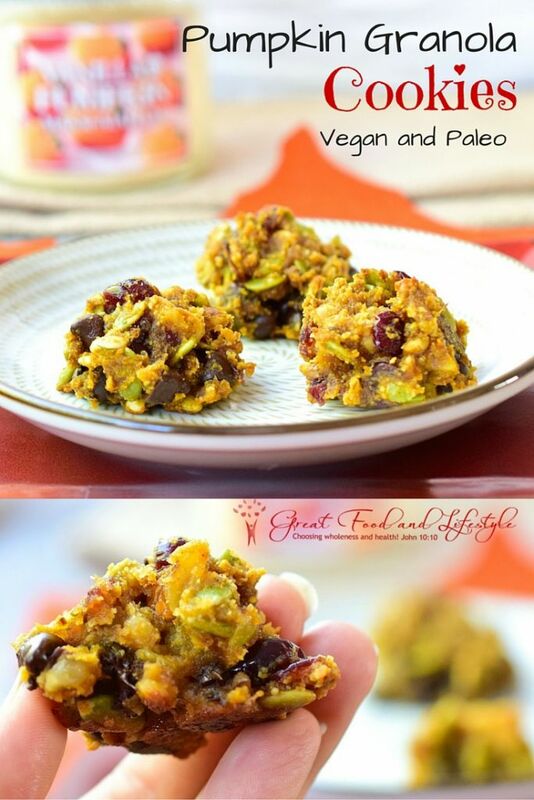 Paleo and Vegan Pumpkin Granola Cookies are a delicious, healthy snack or dessert. They make a great after school snack, too! Preheat the oven to 375 degrees F and line your baking sheet with parchment paper. Stir together all of the ingredients until they are well incorporated. Scoop the batter out onto your baking sheet in 1-2 tablespoon clumps. Bake for 15-20 minutes. If you like them soft and gooey in the center, cook them on the shorter side. This dough is egg free, so you don't need to worry about cooking it all the way! Enjoy!